She threw her diamond ring out of a black cab in Camden. What's this? An outfit post? Yes! First time in ages I know. Just a simple one but I thought I'd share all the same. I've had a busy month with uni and it's definitely not showing any signs of slowing down. On top of that I have lots of exciting things coming up this summer which are making me feel like a grown up and will require lots of planning but I won't forget about my little blog and my lovely followers. I did my nails with Models Own goldrush and black nail pen and a matt coat of Topshop polish. 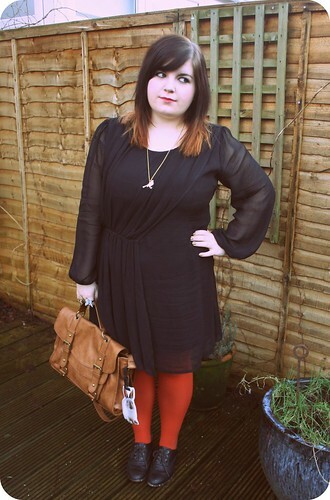 By the way I have a video review coming up this week for the tights I am wearing in this post so check for that. I also have a discussion on bloggers and reviews/sponsorships which I want to ask some opinions about. I'm not looking for sponsers or anything, but I have recently been made to feel like a bit of a puppet for a company I recieved some pushy emails from so I thought it'd be interesting to get some other bloggers views on the whole idea of advertising within blog posts. For now though here are some photos. Rings - (L-R) A-wear, Topshop, Primark. The dress was a bargain, down from £40 to £25 and then when I got to the till it scanned through at £15! I love it, it's from A-wear, one of my favorite shops. It's an Irish shop but I think there are some in England now and they also have a website you can order from. The little rabbit is a luggage tag, it doubles as being ridiculously cute and useful because it has my phone number and email address on it because I loose things a lot. 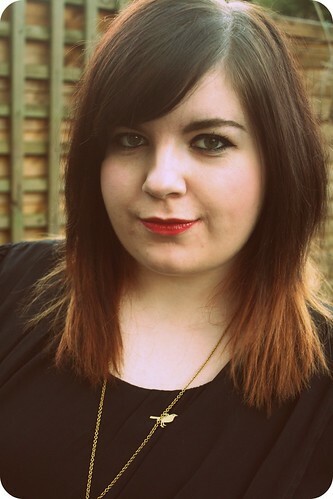 Oh and you can probably see I bleached the end of my hair a few days ago, I was inspired by the lovely Lily of LLYMLRS. I wanted a sort of ombré style. I really love it and it was really easy to do! In the spring I will probably lighten the ends a bit more and then dye them with a bright colour, I miss the pink hair I has as a teenager! Just to finish off I wanted to share a song from one of my favorites, who is also from Ireland! Imelda May, being fabulous. looking lovely! 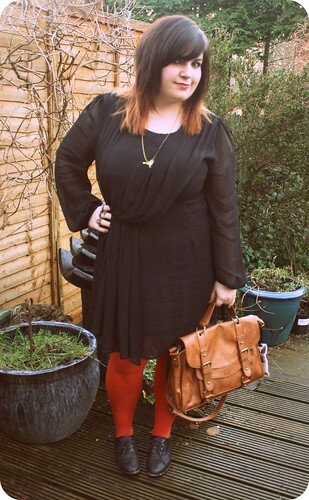 Im tempted to buy some red tights after seeing this, I think a simple black dress and red tights would look awesome! I love the hair too! 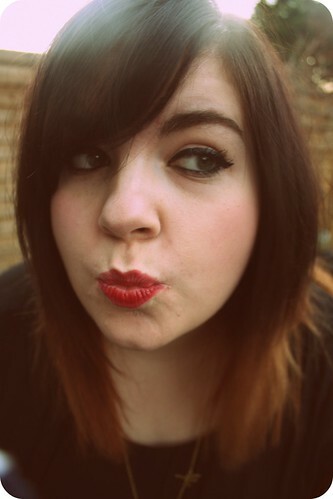 It looks awesome on your dark hair, the ends look pinkish (or is it gingery IRL) either way I love it! I cant wait to read the post on pushy PR people, ive had some awful experiences with them, like daily emails asking me when ill post about something. to the point i dont even want to post about a company! So very lovely! I love how you did your nails. I could never muster the patience for it! The dress is gorgeous! I love its sheerness. Love that dress & that rabbit tag! I love it when things go through cheaper than you thought! Beautiful outfit and ring, but the bag takes the cake! I was lusting after that Topshop bag for a while and when I could finally get it it had sold out. 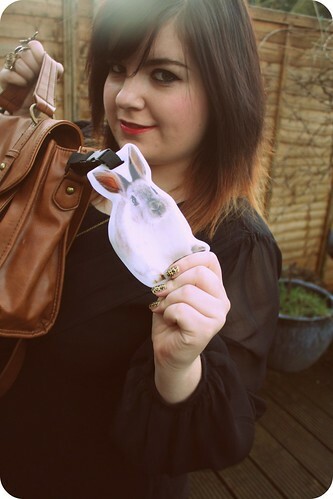 I've only recently started reading your blog and I already love your style! 1. This is my first visit to your blog, so "hi!" 3. Your nails are incredible and the fact that you did them yourself? Wow. your nails are the best ever! Your nails are amazing! And your hair looks great. Oooh, love those tights! What colour did you buy them in? Is it the Rust or Scarlet Red? Hard to tell from the website swatches. Either way love them! Just saw your blog and im LOVING it! oh and those nails are so awsome Im gonna have to do that sometime! Love everything! Your hair looks lovely like that. Such a great look! I love the tights and the necklace is beautiful! Also really diggin your nails! I love that dress! The whole outfit is great. I tired to give myself highlights, I was very nervous. In the end, I did not leave them on my hair long enough, so they did not come out. Love that dress, the drapes are amazing it would look great if there was a brooch were the drapes meet too. The tag on your bag is really cute AND I love your hair. I was thinking about doing something similar to my hair but I thought I might make a right mess and have to dye over it. How did you do it? I was going to apply some pre-lightener to the ends of my hair. Super loving this post! I love your hair (I am getting steadily tempted to do the ombre). I love your outfit. I love the tights. I love the jewellery. I love the dress. I love the nails. Love it all! You look ace, lady! That mani is insanely cool! Love your dress as well! Just a great, great outfit! urgh I hate PR people so much, I've been added to so many PR mailing lists for things that I'm not even interested in without my permission. I know I give my email address out freely on the blog but that is NOT what's it's for! I think your post will be interesting :D I love your hair too, it would look great bleached more and then with bright red put in it! THOSE NAILS ARE LITERALLY THE BEST THING I'VE EVER SEEN. You look so awesome!!! Love the nails!!! 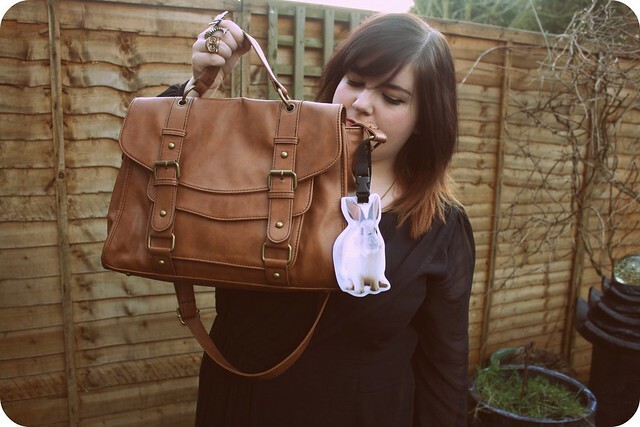 I love your outfit, dress is gorgeous and I want that bag! Your new hair looks stunning & your nails are wicked! I love the dress, particularly the off-center gathering/pleating at the waist. 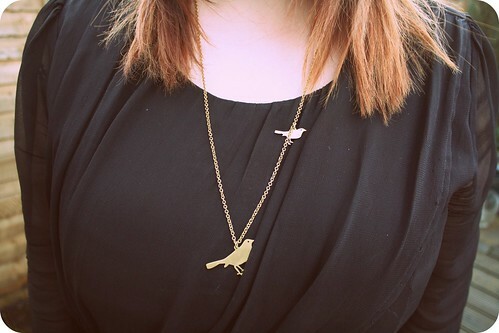 And that darling bird necklace... I've been seeing a lot of birds on blogs lately. And owls. cute cute cute! I love EVERYTHING! Cute one..I love your blog. You are looking awesome in this dress. I love your outfits. Necklace is also too good. Thanks for sharing. The most elegant jewelry designs I seen here. Beautiful collection of diamond jewelry. Specially the Sterling Silver Heart Locket Bangle Bracelet.